Insert Grid at [x] Inserts a grid above the one designated. For detailed instructions, see Grid Options. Remove Grid [x] Removes the designated grid. For detailed instructions, see Grid Options. Properties Opens a window for customizing and formatting the entire plan. For detailed instructions, see Schedule Properties. Cut Removes selected item(s) from the canvas to the clipboard. Shortcut: Ctrl+X. Copy Places selected item(s) onto the clipboard without removing them from the canvas. Shortcut: Ctrl+C. Paste Object(s) Inserts copied items from the clipboard. Shortcut: Ctrl+V. Paste Format Applies only the display and formatting characteristics of copied items from the clipboard to selected objects of the same type. For detailed instructions, see Paste Format. MAIN MENU Contains the options from the main menu bar. Insert Image File(s) Adds an image that will display on the canvas behind all objects except for shades. For detailed instructions, see Image Files. Set This Date as Changes the date of the project start or project completion. For detailed instructions, see Dates Tab. 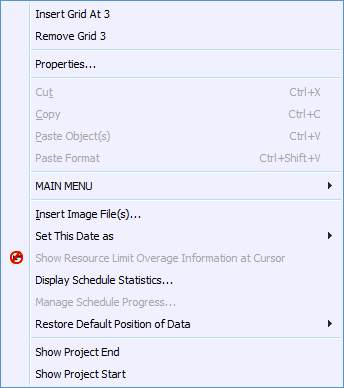 Show Resource Limit Overage Information at Cursor Display current and maximum resource consumption levels when the mouse cursor moves over the canvas. For detailed instructions, see Limiting Resource Consumption. Display Schedule Statistics… Opens a window for viewing basic schedule metrics and statistics (like number of activities, percentile floats, etc.). For detailed instructions, see Schedule Statistics. Manage Schedule Progress… Opens a window for actualizing objects with respect to a data date. For detailed instructions, see Actualizing Objects. Restore Default Position of Data Resets the position of any descriptions, IDs, dates, floats, drifts, buffers, gaps, and total floats back to their default locations. For more info, see Repositioning Fields (GEM). Show Project End Hides/shows the yellow project completion box. Show Project Start Hides/shows the yellow project start box.